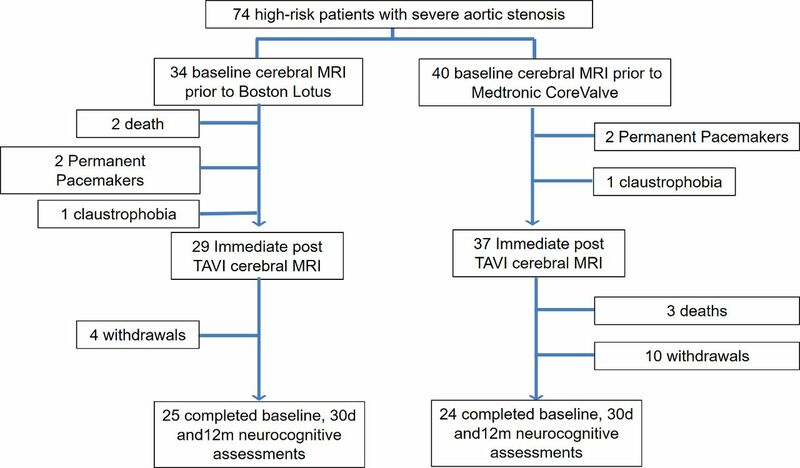 Objective To compare the incidence of silent cerebral infarction and impact on cognitive function following transcatheter aortic valve implantation (TAVI) with the first-generation CoreValve (Medtronic, Minneapolis, Minnesota, USA) and second-generation Lotus valve (Boston Scientific, Natick Massachusetts, USA). Design A prospective observational study comprising a 1.5 T cerebral MRI scan, performed preoperatively and immediately following TAVI, and neurocognitive assessments performed at baseline, 30 days and 1 year follow-up. Setting University hospitals of Leeds and Leicester, UK. Patients 66 (80.6±8.0 years, 47% male) patients with high-risk severe symptomatic aortic stenosis recruited between April 2012 and May 2015. Main outcome measures Incidence of new cerebral microinfarction and objective decline in neurocognitive performance. Results All underwent cerebral MRI at baseline and immediately following TAVI, and 49 (25 Lotus, 24 CoreValve) completed neurocognitive assessments at baseline, 30 days and 1 year. There was a significantly greater incidence of new cerebral microinfarction observed following the Lotus TAVI (23 (79%) vs 22 (59%), p=0.025) with a greater number of new infarcts per patient (median 3.5 (IQR 7.0) vs 2.0 (IQR 3.0), p=0.002). The mean volume of infarcted cerebral tissue per patient was equivalent following the two prostheses (p=0.166). More patients suffered new anterior (14 (48%) vs 2 (5%), p=0.001) and vertebrobasilar (15 (52%) vs 7 (19%), p=0.005) lesions following Lotus. Lotus was associated with a decline in verbal memory and psychomotor speed at 30 days. However, performance longitudinally at 1 year was preserved in all neurocognitive domains. Conclusions There was a higher incidence of silent cerebral microinfarction and a greater number of lesions per patient following Lotus compared with CoreValve. However, there was no objective decline in neurocognitive function discernible at 1 year following TAVI with either prosthesis. Contemporary study comprising both a novel transcatheter aortic valve implantation (TAVI) design technology and an established device. A two-centre study combining both diffusion-weighted MRI and cognitive assessments to comprehensively assess cerebral injury following TAVI. Mid-term follow-up to 1 year. Higher field strength MRI available for more sensitive detection of cerebral embolic infarction. Transcatheter aortic valve implantation (TAVI) is advocated by both European1 and US2 guidance in patients with symptomatic aortic stenosis (AS) deemed inoperable or with too high a predicted postoperative mortality. TAVI is cost-effective,3 significantly improves quality of life4 and, as recent trial data suggest, non-inferior to surgery in intermediate-risk patients,5 potentially expanding its application to a broader population. The Boston Scientific Lotus valve is a novel TAVI iteration that incorporates a number of features specifically designed to improve on first-generation devices.14 As such it exhibits superior deployment success rates when compared with the older Medtronic CoreValve.15 16 However, the key concern of silent cerebral injury following implantation and cognitive decline remains unanswered. We sought to characterise the extent of new silent cerebral infarction using DW-MRI, and investigate longitudinally cognitive function following TAVI with the first-generation self-expanding Medtronic CoreValve and the second-generation mechanically-expanded Boston Scientific Lotus valve. This study prospectively recruited 74 patients with severe degenerative aortic stenosis (AS) from two large UK tertiary cardiothoracic centres (Leeds and Leicester) who were referred for TAVI between April 2012 and May 2015. Severe AS was classified by echocardiography as an aortic valve area of ≤1.0 cm2 or peak velocity >4 m/s. The decision for TAVI in all cases was taken by a multidisciplinary heart team in accordance with international guidance.17 Exclusion criteria included any contraindication to MRI or pre-existing severe cognitive impairment (a Mini-Mental State Examination (MMSE) Score <10). Any patient deemed to exhibit new focal neurological dysfunction consistent with clinical stroke post-TAVI was also excluded. The study complied with the Declaration of Helsinki and all patients provided written informed consent. TAVI was performed using either a first-generation CoreValve system (Medtronic, Minneapolis, Minnesota, USA) or the Lotus aortic valve system (Boston Scientific Corporation, Natick, Massachusetts, USA) employing standard techniques as previously described for both vendors.18 19 Multidetector CT was employed to assist annular sizing and assess aortic calcification prior to TAVI. Percutaneous femoral artery access was the default approach. Balloon valvuloplasty, rapid ventricular pacing and postdilatation (in the case of CoreValve) were employed at the discretion of the operator. All patients received weight-adjusted unfractionated heparin to maintain an activated clotting time >200 s and were treated with dual antiplatelet therapy (aspirin 75 mg and clopidogrel 75 mg) for a minimum of 3 months. None of the TAVI cases involved the use of a cerebral protection device. Data were tested for normality using the Shapiro-Wilk test. Continuous variables were expressed as mean±SD or median (Q2–Q3 or IQR) and were tested for differences by means of a two-sided, unpaired Student’s t-test (for comparison between groups) or a two-sided, paired Student’s t-test (for intragroup comparison). Non-parametrical testing (Mann-Whitney test) was performed where indicated. Categorical variables were given as frequencies and percentages and compared by χ2 statistics or Fisher’s exact test. The PASW software package (V.21.0 SPSS, IBM, Chicago, Illinois, USA) was used for all statistical analyses and a two-sided significance level of p<0.05 was considered statistically significant. The sample size required to detect cognitive decline (defined as a reduction in score by 1SD) was estimated using IBM SPSS sample power V.3, and using normative data for the test to have 80% power (α 0.05), a minimum of 17 patients was required in each group. A total of 66 patients (37 Medtronic CoreValve and 29 Boston Lotus) underwent both the preoperative (median 1 day preprocedure, IQR 14 days) and immediate post-TAVI MRI scans (median 4 days, IQR 4 days). The baseline characteristics of these groups are shown in table 1. Forty-nine of these (24 CoreValve and 25 Lotus) completed serial neurocognitive assessments up to 12 months. Reasons for non-completion were varied reflecting an elderly frail population (figure 1). Study profile. TAVI, transcatheter aortic valve implantation. Patients were not involved with the study design, recruitment, conduct or interpretation of results obtained. Outcome measures were objectively measured and not based on patient experience. TAVI was successful in all cases. Catheterisation data for the TAVI implant procedures are summarised in table 2. Of the 29 Lotus implants, 7 (24%) involved device repositioning. Of the CoreValve implants, there were three instances of embolisation and the requirement of a second valve in three cases (two of whom were due to embolisation). 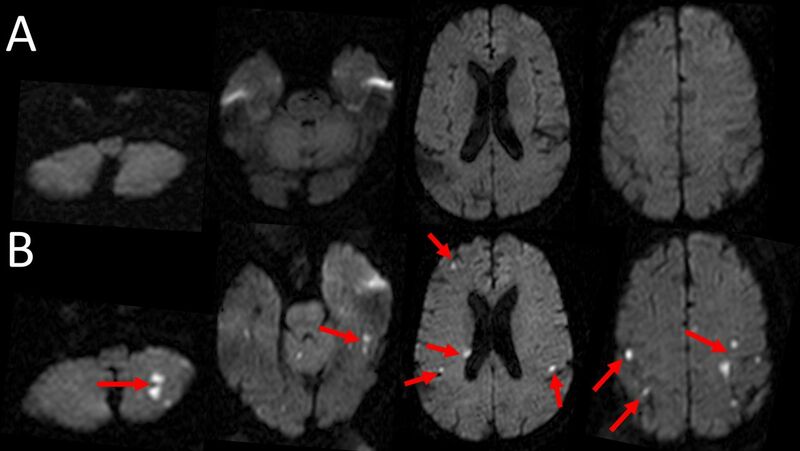 Typical cerebral DWI images at baseline and immediately after TAVI are depicted in figure 2A,B, respectively. Diffusion-weighted MRI of the brain examining silent injury with transcatheter aortic valve implantation (TAVI). Cerebral images, including the brainstem and cerebellum before (A) and after (B) the TAVI procedure. Multiple new cerebral infarctions were seen, some of which are highlighted by the red arrows. Baseline: At baseline, 5 (17%) of the Lotus patients and 10 (27%) of the CoreValve patients had evidence of pre-existing established stroke (p=0.346) with equivalent lesion volume (p=0.529). There was also evidence of recent microinfarction on cerebral DWI in two (7%) Lotus and four (11%) CoreValve patients (p=0.583). A greater proportion of patients undergoing Lotus TAVI had evidence of periventricular ischaemia compared with those undergoing CoreValve TAVI (19 (66%) vs 14 (38%), p=0.026). Postprocedure: Table 3 summarises the findings of DWI following TAVI. There was a significantly greater incidence of new microinfarction observed following Lotus TAVI with a greater number of new infarcts per patient. These were predominantly of small size, with a comparable mean infarcted cerebral tissue volume per patient with both TAVI designs. More patients suffered new anterior and vertebrobasilar lesions following Lotus than CoreValve. The number of new lesions following Lotus repositioning (n=7) and non-repositioning (n=22) did not differ (1.0 (IQR 8.0) vs 3.0 (IQR 3.75), p=0.438) and Lotus repositioning did not correlate with the number of new lesions (p=0.435). For the CoreValve group, the three patients in whom embolisation occurred had significantly greater frequency of new lesions postprocedure (4.0 (IQR 0.0) vs 1.0 (IQR 2.0), p=0.011), but no difference was seen in the three requiring a second valve (4.0 (IQR 0.0) vs 1.0 (IQR 2.0), p=0.148). Typical findings of new cerebral infarctions detected by DW-MRI post-TAVI are exemplified in figure 2. Neurocognitive performance, prior to and following Lotus and CoreValve TAVI, are shown in table 4. For the vast majority of domains, including global cognition, psychomotor speed, executive function and fine motor coordination, no change in test scores was observed at 30 days or 12 months following TAVI, with either the Lotus or CoreValve prostheses. HVLT was used to test mnemonic function and verbal memory, and total learning scores remained unchanged over time for both CoreValve and Lotus. However, delayed recall scores and discrimination index were significantly lower at 30 days following Lotus (table 4), with 12-month scores returning to baseline level (delayed recall: 7.6±3.0 vs 9.0±6.7, p=0.320, discrimination index: 10.2±1.5 vs 10.1±2.4, p=0.867), with no change observed following CoreValve. TMT assesses executive function and psychomotor speed, with TMT A preceding the more challenging TMT B. TMT B scores were significantly lower at 30 days following Lotus (table 4), with 12-month scores again returning to the baseline level (170.9±86.5 vs 152.3±87.5, p=0.215), and no change observed following CoreValve at any time point. At the 1-year follow-up, for each TAVI prosthesis we sought to compare individuals with and without DW-MRI lesions with respect to neurocognitive performance (table 5). Of the 25 Lotus patients that completed 12-month assessments, 19 (76%) exhibited new DW-MRI lesions post-TAVI, and of the 24 CoreValve patients, 13 (54%) were DW-MRI positive (p=0.140). Lotus patients with DW-MRI lesions exhibited an overall decline in global cognition (MMSE) at 12 months compared with those without (figure 3A,B). CoreValve patients with DW-MRI lesions had a significantly lower HVLT discrimination index at 12 months compared with those without (figure 3C,D). For all of the remaining neurocognitive domains, no difference in performance at 1 year was noted between patients with and without DW-MRI lesions for either TAVI prosthesis. Line graph depicting change in Mini-Mental State Examination (MMSE) (A and B) and Hopkins Verbal Learning Test (HVLT) Discrimination Index (C and D) over time following Lotus and CoreValve. (Red lines indicate patients with diffusion-weighted (DW) MRI microinfarcts, blue lines those without). Cognitive decline after cardiac surgery is associated with increased morbidity and mortality26 and has significant social and economic implications.23 TAVI has revolutionised the management of high-risk patients with symptomatic aortic stenosis worldwide. However, determining whether the high incidence of silent DW-MRI lesions seen post-TAVI predisposes to cognitive decline, and whether TAVI design has any impact on this, remains a crucial prerequisite to its more widespread use. 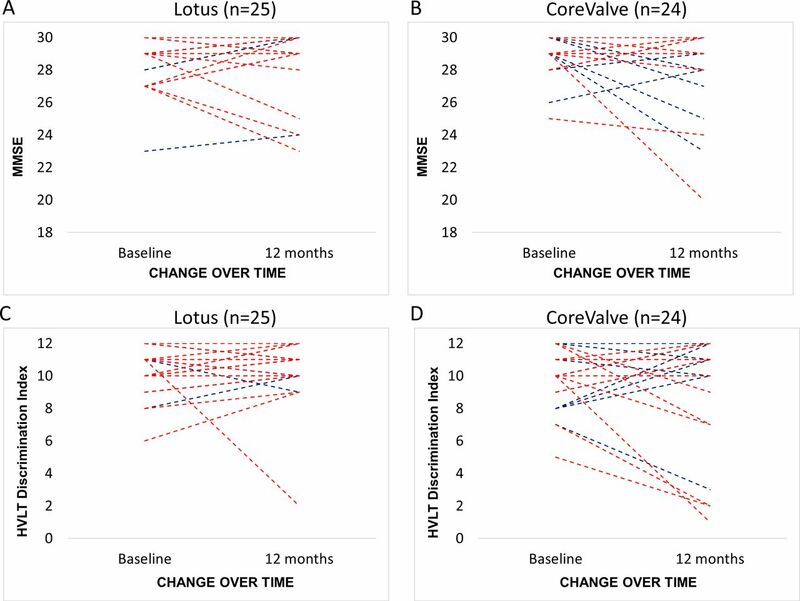 Despite its advanced design, our study suggests that the use of the second-generation Lotus valve carries a higher risk of silent cerebral infarction, but without an objectively discernible decline in neurocognitive function at 1 year, comparable to the CoreValve prosthesis. The multiple and diffusely distributed silent cerebral lesions detected by DW-MRI post-TAVI are in keeping with an embolic aetiology. We have previously shown severity of aortic arch atheroma is an independent risk factor for the development of new cerebral infarcts following TAVI.10 Transcranial Doppler studies, performed during TAVI, have indicated balloon valvuloplasty, prosthesis positioning and implantation as particular moments for cerebral embolisation,27 suggesting that manipulation of the native aortic valve is also an important source. Oversizing has been associated with tissue embolisation on histopathological analysis28 and is recommended to a degree with first-generation designs in order to prevent paravalvular regurgitation. The higher cover index and greater displacement forces on degenerate native leaflets might consequently be expected to precipitate a greater degree of tissue dehiscence and embolisation. Balloon postdilatation has also been demonstrated to significantly predict acute neurological events.7 Despite the larger valve size, greater frequency of valve embolisation and use of postdilatation, new DW-MRI lesions were less frequently seen following CoreValve. The Lotus valve is fully repositionable, reflecting the longer fluoroscopy times observed with this prosthesis. However, our data suggest that repositioning per se was not a significant contributor to the frequency of new DW-MRI lesions observed. The Lotus delivery system typically requires 20F or wider sheaths, and thus greater endothelial disruption during manipulation around the aortic arch may underlie the higher incidence of cerebral microinfarction seen after Lotus TAVI. Future studies are required to determine whether these findings may translate into variation in the incidence of clinical stroke. We and others have previously demonstrated that majority of DW-MRI lesions immediately post-TAVI appear to resolve by 6 months.11 However, this resolution does not necessarily indicate tissue normalisation. The insensitivity of lower field strength imaging has been suggested as one explanation.13 Furthermore, rat models of cerebral ischaemic insult confirm histological neuronal damage despite DW-MRI resolution, cautioning the use of imaging alone to assess ischaemic injury.29 We therefore sought to compliment cerebral MRI with a battery of well-validated neurocognitive assessment tools. There is a large body of evidence to indicate that silent cerebral injury heralds adverse cognitive consequences. They are associated with an increased risk of mild cognitive impairment,30 and may double the risk of dementia (most commonly Alzheimer’s disease), with a steeper rate of cognitive decline observed the greater the number of infarctions.12 It is feasible that the decline in verbal memory seen at 30 days following Lotus, which was not observed following CoreValve, is a reflection of the associated higher burden of DW-MRI lesions. To date, few studies have combined DW-MRI and cognitive assessment following TAVI with CoreValve or Edwards-Sapien. The largest involved 111 subjects23 with the other three averaging 40 patients.8 22 31 No decline in any cognitive domain was observed despite the occurrence of diffuse microinfarcts affecting both cerebral hemispheres,22 and patients with and without DW-MRI lesions performed equally well.23 These findings are consistent with our study. Our observed high incidence of new DW-MRI lesions post-TAVI appeared to lack clinical sequelae when cognition was objectively assessed at 12 months, and this was the case following both first-generation and second-generation devices. This study is noteworthy in the context of contemporary TAVI trials. Results from the PARTNER 2 Trial have suggested that transfemoral TAVI results in a lower rate of death or disabling stroke in intermediate-risk patients, with an average age similar to this study of 81.5 years, when compared with surgery.32 Younger patients would expectedly exhibit lower burdens of aortic atheroma and thus fewer silent DW-MRI lesions, irrespective of TAVI design. In the recent Claret Embolic Protection and TAVI (CLEAN-TAVI)33 and SENTINEL34 trials, cerebral protection reduced new ischaemic cerebral lesions. However, Lotus patients were notably absent from both studies. While pre-existing lesion volume predicted future cerebral lesion volume,34 the baseline and post-TAVR volume of established DWI lesions in our study of both CoreValve and Lotus were equivalent. Our work suggests that devices to reduce lesion frequency may be a particularly pertinent adjunct to Lotus TAVI and potentially offset the decline in verbal memory and psychomotor speed we observed at 30 days. While our work indicates DW-MRI lesions do not seem to affect mid-term neurocognitive function, caution is required not to dismiss DW-MRI lesions as entirely innocuous, particularly given even small lesions tripled the risk of stroke-related death in healthy subjects aged 50–73 years over 14 years of follow-up.35 Longer follow-up is required to clinically appreciate the natural history of cerebral injury incurred during TAVI. Patients were not randomised to CoreValve or Lotus and hence the study is vulnerable to selection bias. Furthermore, we have not directly compared cognitive performance from our two TAVI groups with that of healthy octogenarians, or patients managed conservatively. There was attrition in patients completing the study protocol, with 5 patients failing to complete postintervention imaging and 17 patients with imaging data failing to complete 12-month neurocognitive assessments. Fourteen patients (19%) withdrew from the study and this was often due to deteriorating health or transfer into long-term nursing care There is hence an inherent risk of bias as potentially those with most marked decline in cognitive function might have been excluded. Furthermore, our finally analysed patient group sizes confer limited power to report ‘no difference’ in baseline variables raising the possibility of type 1 and type 2 errors, and transfer bias influencing our final group comparisons. The CoreValve has been clinically in use for much longer than the Lotus valve. Therefore, the greater degree of new DWI lesions seen in the Lotus group may partly reflect an operator ‘learning curve’ during which experience and fluency in use of Lotus delivery equipment was refined. Presently, there is no internationally accepted definition of cognitive decline following cardiac procedures, with the potential for variation between studies. We have used a comprehensive battery of validated tests that cover a wide variety of important higher neurocognitive faculties, but these may potentially be insensitive to change and lack validation in the context of TAVI. Patients in atrial fibrillation on formal anticoagulation had their warfarin withheld prior to their TAVI procedure, with full dose heparin during the TAVI implant and recommencement of warfarin on the evening of the procedure. However, it is not possible to exclude cardiac thrombus associated with atrial fibrillation as a potential contributor to microinfarction. Our work employed 1.5 T field strength imaging, which is the case for the majority of similar published studies. However, the use of higher field strengths may have increased detection of microinfarction and characterise more accurately the burden associated with different TAVI devices. There was a higher incidence of silent microinfarction with a greater number of lesions per patient following second-generation Lotus compared with the first-generation CoreValve implantation. However, there was no objective decline in neurocognitive function discernible at 1 year following TAVI with either prosthesis. Contributors JPG conceived and designed the study. TAM drafted the manuscript. CL compiled the comprehensive battery of neurocognitive tests and instructed on their correct implementation. FR, TAM, AU, LED and AS performed the recruitment of patients and their neurocognitive assessment. GPM supervised and AS oversaw the University of Leicester contribution. MI and AJPG performed MRI image analysis. DJB and CM carried out TAVI implantation. TAM and AU analysed data and interpreted the results. PPS and PG gave input into data interpretation. PPS, PG, JRJF, GJF, SP and GPM were involved in critical and intellectual revision of the article. All authors edited and revised the manuscript. All authors read and approved the final manuscript. Funding This study was part-funded by the British Heart Foundation (PG/11/126/29321), an investigator research grant from Boston Scientific and also the National Institute for Health Research (NIHR) Leeds Clinical Research Facility. Competing interests DJB and CM are consultants and proctors for both Medtronic and Boston Scientific. JPG and SP have received an educational research grant from Philips Healthcare. Ethics approval National Research Ethics Service (08/H1307/106). Data sharing statement All clinically important data from this observational study have been reported on in the manuscript.